I have been eying these Steve Madden sandals since I first spotted them on pinterest. Ironically they were pinned with a nice picture of some black lacquered toes, fresh ink, and in the colour white. PRAISE THE LORD though, these sandals come in multiple colours, but luckily my favourite, black. Sandals are always something I find difficult to buy since none of them seem very personal or unique. I can see myself wearing these with long maxi skirts, hi-lo dresses, a bold hat/high waisted shorts, and even throw them on with jeans. 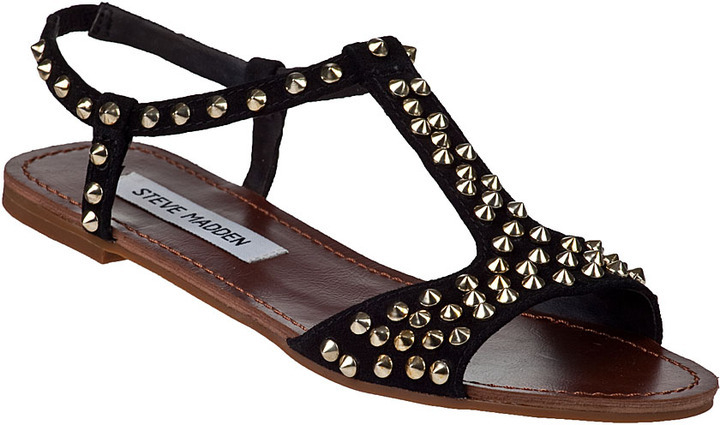 I only have one pair of sandals I truly like so this will be a good addition to my closet. Sadly these shoes are $69.95 so I will properly buy them as we creep towards summer!